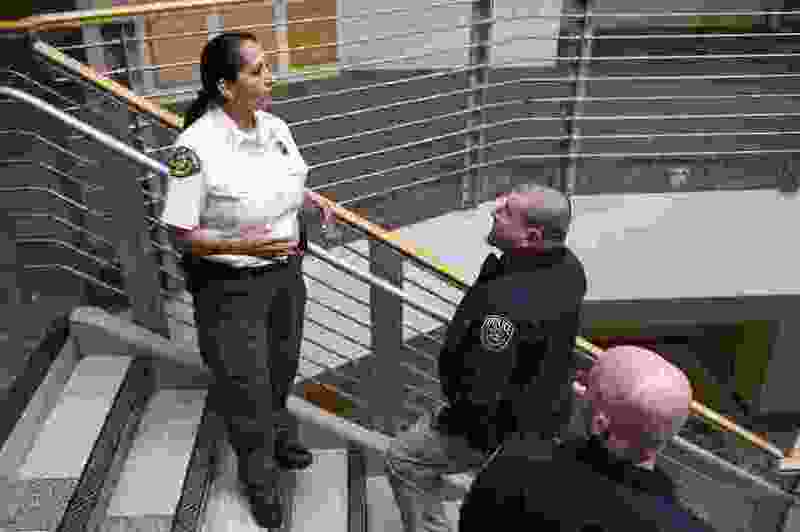 (Francisco Kjolseth | Tribune file photo) Rosie Rivera, the first woman in Utah to serve as any county's sheriff, speaks with Unified Police officers at the Salt Lake County Sheriff's Officen Salt Lake City on Monday, Dec. 11, 2017. The Unified Police Department will end its practice of withholding the names and genders of all officers from the state’s transparency website on security grounds and will begin disclosing the identities of those who are not working undercover or likely to do so soon. The UPD board also is taking steps to make more information public about its own members and activities by posting on its website the board minutes, meeting recordings and board contact information. But department leaders defended the common practice of officers moonlighting in security jobs with private contractors, disputing that it may create divided loyalties. Salt Lake County Sheriff Rosie Rivera and Millcreek Mayor Jeff Silvestrini, who is the UPD board chairman, promised steps toward more openness but rejected restrictions on moonlighting officers in response to recommendations from State Auditor John Dougall made in an audit released Monday. Dougall’s office said UPD’s practices regarding public disclosure were in violation of Utah transparency laws, which, for instance, require publishing the names, genders and salary of public employees on the Utah Public Finance website. The auditor was also critical of the practice of allowing UPD officers to moonlight as security detail for private contractors without clearer rules. UPD officers collected more than $2.4 million in pay for these secondary security jobs during the two-year period examined by the audit. The audit recommended requiring that payment from contractors be made to UPD, which then could distribute the compensation to officers. Rivera and Silvestrini disputed the audit conclusion that these security details confused the public or caused divided loyalties. “UPD policy states that officers are considered on duty, regardless of whether they are working secondary employment or off duty in the event they take law enforcement action,” the agency leaders responded. They said UPD will preserve this option for officers, but agreed it might be good for the Legislature to implement a statewide standard to eliminate competitive advantages among police agencies. Rivera’s office did not respond to a request for comment Monday. The state audit of UPD, conducted from August 2015 to August 2017, covered the administration of former Salt Lake County Sheriff Jim Winder, who stepped down early to take on the post of police chief in Moab. Rivera then was appointed to fill out the remainder of Winder’s term and is up for election on the Nov. 6 ballot, along with Republican challenger Justin Hoyal. Hoyal, a UPD lieutenant, called a news conference earlier this month to question the leadership skills of Rivera. His event came on the heels of an emergency meeting of the Riverton City Council signaling its intent to leave UPD because of difficulty in obtaining details about changes the board proposed that would affect the city’s contract. The UPD board tabled its proposed changes and promised to work with Riverton and other member cities. But the auditor was critical about the structure of the department, questioning the requirement that Salt Lake County’s sheriff automatically be the UPD CEO and pointing out that fewer than half the voters in the county are in the UPD jurisdiction. The audit also questioned having the sheriff as the CEO and, at the same time, serving as a board member. Rivera and Silvestrini said those points in the audit deserve further discussion, including with the state Legislature, which wrote the governing laws.